An isolated hilly land that is enveloped by splendid sights of grandiose Himalayas and wonderful kunds, Rudranath proffers once in a lifetime opportunity for those who have the courage to get on audacious trips. 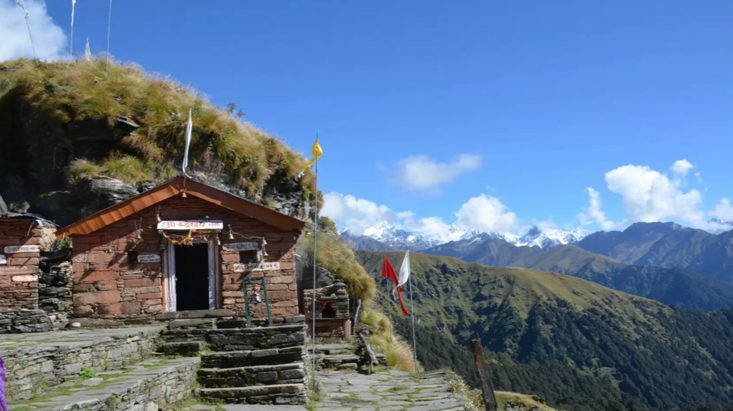 It is nestled at an altitude of 7,500 ft in the Garhwal Himalayan peaks of Uttarakhand. This is the third temple among the Panch Kedars of Lord Shiva. Here, Lord Shiva is worshipped in the appearance of face (Neelkanth Mahadev). This quaint destination tenders a perfect ambience and harmony of a spiritual center. The bystanders would be amazed to experience the pure and untouched exquisiteness of mother’s nature. All these appeals make this place more beautiful and revered for pilgrims who come from different parts of the world to attain peace of mind and salvation. The temple is deemed to have been set up by the Pandavas named Bhima, Yudhistira, Nakula, Arjuna and Sachdeva were the five sons of Pandu. These heroes succeeded in the Kurukshetra war against Kauravas. Myth has it that after the battle, Pandavas were found guilty of killing their own cousins and to wash away their sins went in search of Lord Shiva to Himalayan Mountains. He evaded them and disappeared into the earth as a bull and appeared in different forms at the five spiritual centers of Panch Kedars, his hump appearing in Kedarnath, his face emerging in Rudranath, his stomach in Madhyamaheshwar, his hair coming into view in Kalpeshwar and his arms showing up in Tungnath. An emblematic picture of Lord Shiva is carried to Gopeshwar in winter to pay homage. The journey commences from Gopeshwar through Sagar, Lyuti bugyal, Panar, Pitradhar with the backdrop of thick forest, sparkling lakes and emerald beauty. After passing through Dhalabani Maidan, it lastly makes it to Rudranath. Vandevi is paid respect and it is believed that Vandevi takes care of the place. A yearly fiesta is celebrated between July and August near Rakshabhandan on the full moon day, which is mostly graced with the existence of the locals. Summers are very pleasant with average temperature of 150 C while winters remain freezing with temperature of 40C. During monsoon time, one can catch a splendid view of the surroundings while enjoying a very little rain. By Rail: Haridwar is the nearest railway station to arrive at Rudranath. By Air: Jolly grant airport situated in Dehradun is the easiest way to get here. This journey will render you some of the best memories that you will love to recall in a good time.